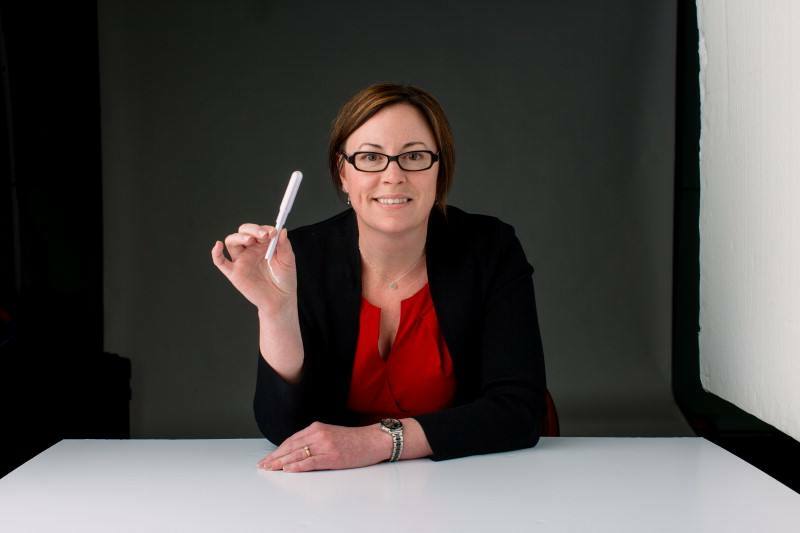 Dr. Jamie Bakkum-Gamez holds a tampon, an essential part of a new endometrial cancer screening test that she and her team are developing. Ever since she assisted in surgery at the age of eight, Jamie Bakkum-Gamez, M.D., was hooked – on medicine. The surgery took place on her family’s farm in Wisconsin. The patient was a Holstein cow. The surgeon was a veterinarian. From that day forward, Dr. Bakkum-Gamez, a gynecological oncologist at Mayo Clinic’s campus in Rochester, Minnesota, pursued her dream to become a doctor. She chose to focus her career on taking care of women with gynecological cancer and is co-leader of Mayo Clinic Cancer Center Women’s Cancer Program. “I am inspired every day by my patients. Every woman with gynecological cancer has a story. These women come to me with so much life experience and the drive to fight their disease. That’s why in addition to my clinical practice, I pursue research to find answers to address critical issues facing my patients. It’s what has inspired me to work to develop a screening test for endometrial cancer (uterine cancer), a gynecological cancer for which there is no current screening test for the disease,” says Dr. Bakkum-Gamez. Dr. Bakkum-Gamez explains that while many women with endometrial cancer will have a slow growing cancer that can be treated if detected early, approximately 20 percent of women will have an aggressive form of the disease that can spread to other parts of the body and can be fatal. That’s why early detection of the disease is so important. “If we can diagnose endometrial cancer early, we can provide better treatment and better outcomes for our patients. Projections show that by 2030, the incidence of endometrial cancer will surpass colon cancer, a cancer which doesn’t just affect women. This increase in endometrial cancer is due to the population aging and the growing obesity epidemic. Age and obesity along with diabetes, hypertension and a family history of colon or endometrial cancer, which can be signs of an inherited condition called Lynch syndrome, are all risk factors for endometrial cancer” says Dr. Bakkum-Gamez. Inspired by the patients she cares for each day, Dr. Bakkum-Gamez is working to create a screening test for endometrial cancer that uses a tampon to collect vaginal fluid from a patient. The fluid is then analyzed to detect molecular and genetic changes that are indicators of endometrial cancer. “Only five to ten percent of women with symptoms of endometrial cancer, which include abnormal vaginal bleeding, actually have the disease. However, nearly all women with these symptoms undergo an invasive endometrial biopsy to rule out endometrial cancer. Performed in the clinic, this procedure involves the collection of tissue from the uterus and can be painful and cause cramping. We are working to develop a better test,” says Dr. Bakkum-Gamez. Patient-friendly, non-invasive test: The test uses a tampon, which is a familiar hygiene product used by most women. It is non-invasive, pain free and could be used in a doctor’s office or at home. Improves access to screening: Because a woman can collect a sample at home, it will improve screening for those women with limited access to preventive medical care. If a woman is experiencing symptoms, she can use the test to provide a fluid sample and then mail it in for analysis. After initial research efforts to identify molecular and genetic markers unique to endometrial cancer, Dr. Bakkum-Gamez and her research team will soon be testing the new screening tool in a clinical trial. The study will compare the accuracy of the new tampon screening tool to the current clinical approach of endometrial biopsy. According to Dr. Bakkum-Gamez, collaboration with researchers and physicians from multiple specialties including Mayo Clinic Center for Individualized Medicine Epigenomics Program, Mayo Clinic Cancer Center, Department of Obstetrics and Gynecology, Department of Laboratory Medicine and Pathology, and Department of Gastroenterology and Hepatology, has played a critical role in this groundbreaking research effort. “Ongoing collaboration with researchers throughout Mayo has allowed us to move forward with the development of a test that could revolutionize screening for endometrial cancer,” says Dr. Bakkum-Gamez. Ingenious! Keep up the innovation and good work, Dr. Bakkum-Gamez and Team.